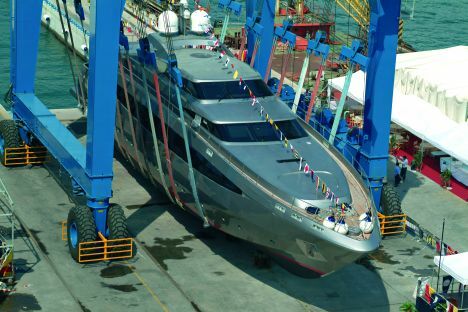 On the last June 5 the Baglietto Yard launched a new 42 - metre superyacht. The architects Tommaso Spadolini teamed up to greatly design exterior lines and interior, respectively. The layout develops on three decks: the upper deck features either an external liveable area or an inner saloon where we also find the wheel house. The main deck offers an owner's suite in the bow, aft of which a huge saloon stretches providing a multi - medial system for entertaining. The lower deck along there are four guest cabins, galley and separate crew's quarter with private bathrooms. The modern - styled furniture is fitted with luxury in mind. A unique feature of this 42 - metre Baglietto are a great powerful pairing of MTU engines capable to provide a power of 7.400 HP in combination with a Kamewa waterjet propulsion, a binomial assuring either high performance or easy handling. Providing a half load maximum speed of 35 knots, according to what stated by this great appreciated yard, the 42 - metre Baglietto is one of the most performing motor yachts of her class despite loss of cruising range - 600 miles at a speed of 24 knots -. Cruising range at 24 knots speed: 600 miles.